This genus is accepted, and its native range is NE. Tropical Africa, S. Yemen, Bangladesh to Japan and Australia. 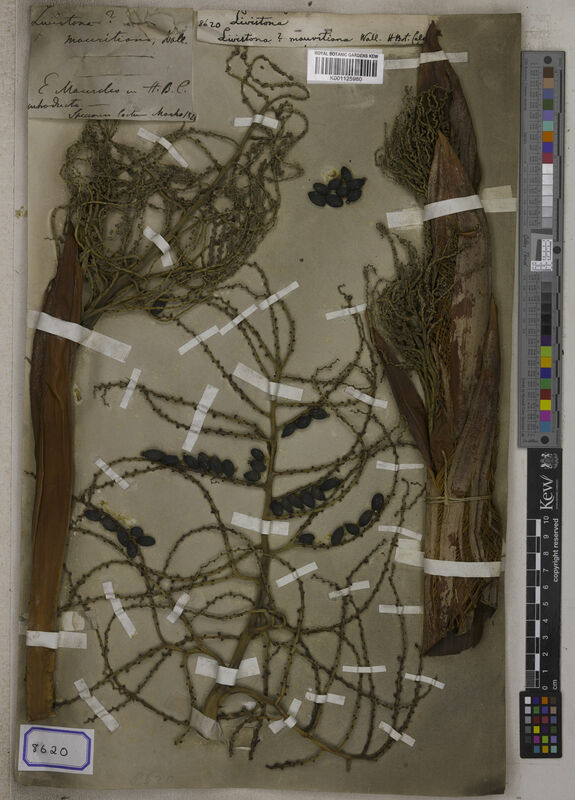 Leaf (L. australis and L. chinensis; Tomlinson 1961),roots (Seubert 1997), floral (Morrow 1965); stegmata(Killmann and Hong 1989). The ecology is very varied. 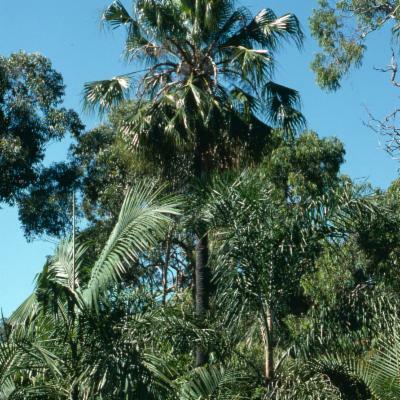 There are species adapted to fresh water and peat swamp forest (L. saribus), montane forest (L. tahanensis and L. jenkinsiana), undergrowth of tropical rain forest (L. exigua), dry savannah woodland (L. humilis and L. lorophylla), canyon Species are frequently gregarious, the tallest species often occurring in spectacularly beautiful groves (e.g., L. rotundifolia in Celebes and elsewhere). 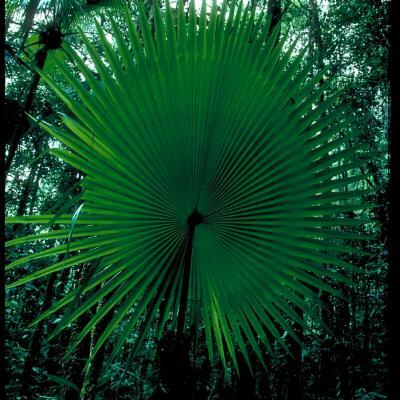 Cabbage palm (Livistona australis), Chinese fan palm (L. chinensis), serdang (West Malesian species). 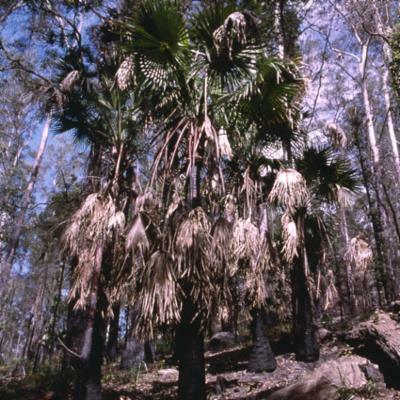 Usually tall, single-stemmed fan-palms of the Horn of Africa and Arabia, and Himalayas to Australia; there are a few dwarf species; most are hermaphroditic but a few dioecious species are known. 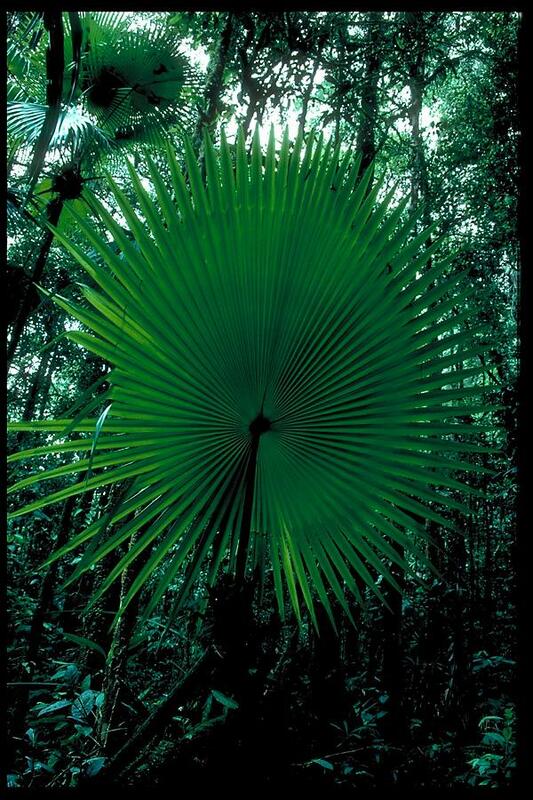 About 35 species, ranging from the Horn of Africa and Arabia (Livistonia carinensis), to the Himalayas and Ryukyu Islands, south through Indochina and Malesia to New Guinea, the Solomon Islands and Australia, where there is a great diversity of species. 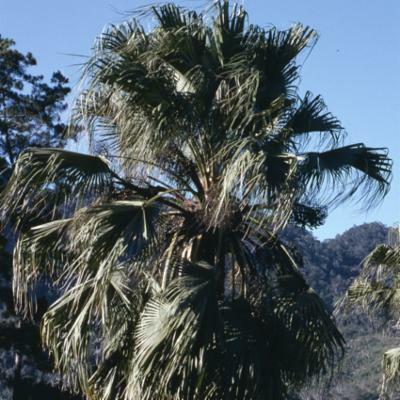 Slender (rarely) to robust, solitary, armed or unarmed, pleonanthic, hermaphroditic (rarely dioecious), shrub or tree palms. 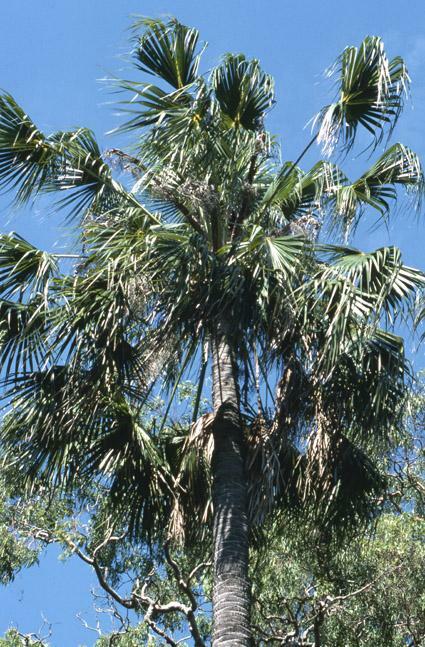 Stem erect, obscured at first by persistent sheaths, later becoming bare or covered with persistent petiole bases, conspicuously or obscurely ringed with leaf scars. 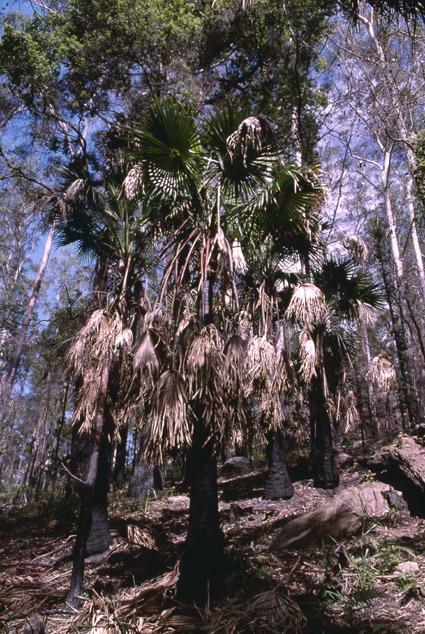 Leaves induplicate, palmate or costapalmate, marcescent or deciduous under their own weight, a skirt of dead leaves sometimes developing; sheath disintegrating into a conspicuous interwoven, often cloth-like, reddish brown mass of broad and fine fibres; petiole well developed, grooved or flattened adaxially, rounded or angled abaxially, sparsely covered with indumentum or not, expanded and sometimes bulbous at the occasionally persistent base, the margins unarmed or armed with inconspicuous to robust horizontal spines or teeth; adaxial hastula well developed, abaxial hastula poorly developed or absent; blade divided along adaxial ribs to varying depths to form single or, very rarely, multiple-fold segments, these further divided for a short to long distance along abaxial folds near the tip, rarely the adaxial splits almost reaching the hastula and the costa, the segments then all single-fold and very fine; segments stiff or pendulous, interfold filaments sometimes present, scattered caducous indumentum present along ribs, wax sometimes present on the abaxial surface, more rarely waxy on both surfaces, midribs conspicuous, transverse veinlets obscure or conspicuous. Inflorescences interfoliar, solitary, branched to 5 orders, sometimes immediately trifurcating to give 3 equal ‘inflorescences’ enclosed within a common prophyll, each branch with its own prophyll (e.g. L. rotundifolia); peduncle elongate; prophyll 2-keeled, tubular, closely sheathing, variously covered with indumentum or not, frequently tattering at the tip; peduncular bracts 1–few, tubular, like the prophyll; rachis usually longer than the peduncle; rachis bracts variously covered with indumentum, each subtending a first-order branch; bracts of subsequent orders generally inconspicuous; rachillae erect, pendulous or divaricate, glabrous or hairy, usually numerous, bearing spirally arranged flowers, singly or in cincinni of up to 5, sessile or on low tubercles or slender stalks, each group subtended by a minute rachilla bract and each flower bearing a minute bracteole. Flowers small to very small, usually cream-coloured; calyx with receptacle often producing a short, broad stalk, tubular above, tipped with 3 triangular lobes, these sometimes imbricate at the very base, glabrous or hairy; corolla shallow, tubular at the base, apically with 3 triangular, valvate lobes; stamens 6, epipetalous, the filaments connate to form a fleshy ring, tipped with short, slender distinct filaments, anthers medifixed, rounded or oblong, latrorse; gynoecium tricarpellate, the carpels wedge-shaped, distinct in the ovarian region, connate distally to form a common, slender style, with an apical, dot-like or minutely 3-lobed stigma, ovule basally attached, anatropous; where dioecious, anthers or ovules not developing but otherwise as in the hermaphroditic. Pollen ellipsoidal, bi-symmetric, occasionally slightly asymmetric; aperture a distal sulcus; ectexine tectate, psilate and sparsely perforate, finely perforate, perforate, perforate-rugulate, foveolate or finely reticulate, aperture margin sometimes slightly finer; infratectum columellate; longest axis 19–37 µm [10/33]. Fruit usually developing from 1 carpel, globose to ovoid, pyriform, or ellipsoidal, small to medium-sized, variously coloured, green, scarlet, blue-green, blue-black, black or dark brown, stigmatic remains apical, sterile carpel remains basal; epicarp smooth, dull or shining, often with a wax bloom, mesocarp thin or thick, fleshy or dry, somewhat fibrous, usually easily separated from the bony or woody endocarp. Seed ellipsoidal or globose, basally attached, hilum circular or ± elongate, raphe branches few or lacking, endosperm homogeneous, penetrated laterally by a variable, frequently convoluted intrusion of seed coat; embryo lateral. Germination remote-tubular; eophyll lanceolate, plicate, minutely toothed apically. Cytology: 2n = 36. Many are planted as ornamentals. 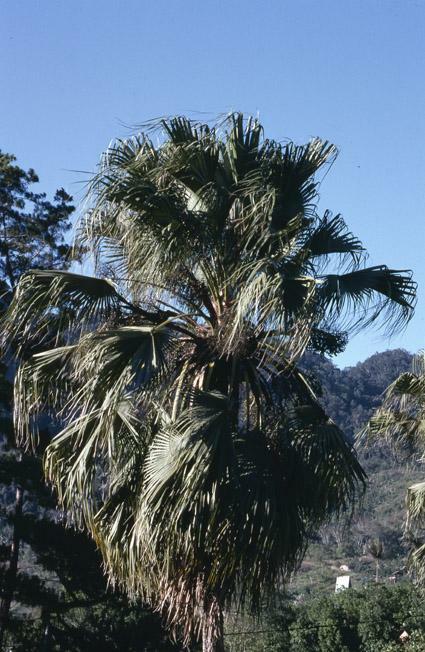 Leaves of severalspecies are used for thatch, their segments for umbrellas, andfibres for rope and cloth. 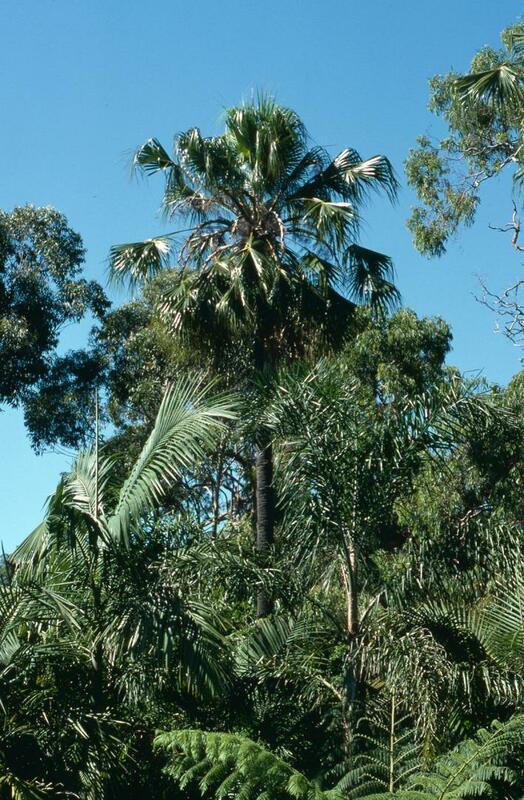 Trunks have been used for wood.The ‘cabbage’ of L. australis is edible. Bacon, C.D. & Baker, W.J. (2011). 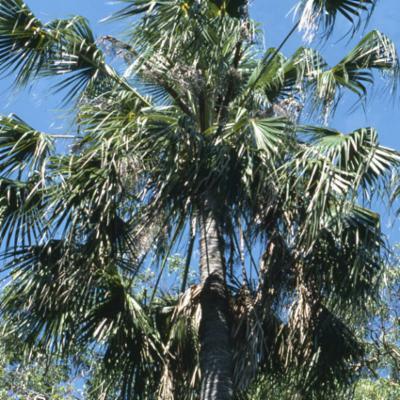 Saribus resurrected Palms; Journal of the International Palm Society 55: 109-116.